Background: This analysis was done with the aim to study the overall impact of docetaxel and cabazitaxel treatment using quality-adjusted time without symptoms and toxicity (QTWiST) analysis in head and neck cancer patients receiving second-line treatment. Methods: Overall survival (OS) was partitioned in three health states for QTWiST analysis. Toxicity (TOX) state was defined as the cumulative number of days spent in grade 3 or above toxicity postrandomization and before progression. TWiST state was defined as the cumulative number of days spent postrandomization and before progression without grade 3 or above toxicity. REL state was defined as the time spent in days postprogression till death. A threshold utility analysis was performed. Results: The restricted mean TOX state duration in cabazitaxel arm was 2.26 days (95% confidence interval [CI] 1.12–3.40) versus 1.54 days (95% CI 0.56–2.53 days) in docetaxel arm. In threshold utility analysis, the mean difference in QTWiST was in favor of docetaxel arm and ranged from −7.194 (utility for TOX) to −35.96. For any combination of utility score of REL >0, with any combination of utility score of TOX, the difference in mean QTWiST between the two arms was >14 days (i.e. >10% of OS), in favor of docetaxel arm which is considered clinically meaningful. Conclusion: Patients randomized to docetaxel arm had a higher QTWiST score than patients in cabazitaxel arm. There was a suggestion that docetaxel led to better quallity of life without toxicity or symptoms, which would require confirmation in a larger study. However, in spite of these benefits, palliative chemotherapy is commonly criticized for the toxicity it produces. In the EXTREME study, grade 3–4 adverse events were seen in 82% of patients in cetuximab arm. Similar high-grade 3–4 adverse events are reported in multiple second-line chemotherapy studies.,,, Although these figures represent the maximum grades of toxicity occurring, they do not explain the temporal profile of toxicity. Certain chemotherapy toxicities such as neutropenia are typically short-lived while some such as neuropathy persist for longer intervals. Hence, performing an analysis that takes into account the duration of adverse events while comparing the outcomes of chemotherapy is important. Doing quality-adjusted time without symptoms and toxicity (QTWiST) analysis overcomes this issue. We recently reported the outcomes of a randomized study comparing docetaxel versus cabazitaxel in head and neck cancer. This post hoc analysis was done with the aim to study and evaluate the impact of docetaxel and cabazitaxel treatment on the quality of survival for patients with head and neck cancer. This was a phase II, open-label randomized study, which included adult head and neck cancer patients who had either platinum-refractory disease or had progressed after first-line palliative chemotherapy. Patients were randomly assigned in 1:1 fashion to either single-agent intravenous docetaxel (75 mg/m2) or cabazitaxel (20 mg/m2). The chemotherapy was administered on day 1 with standard supportive medications every 21 days till either progression or development of intolerable side effects. All patients received primary granulocyte-colony stimulating factor prophylaxis. Response assessment scans were done every 6 weeks while the patients were on treatment and every 8 weeks post treatment completion. The response to chemotherapy was documented in accordance with the RECIST version 1.1 and adverse events were recorded in accordance with the CTCAE version 4.03. Patients were followed up till death. The study was approved by the institutional ethics committee and was conducted in accordance with good clinical practice guidelines and Declaration of Helsinki. All patients provided written informed consent before participation in the study. RStudio version 1.1.03: (Integrated Development for R. RStudio, Inc., Boston, MA) was used for analysis. QTWiST function for R provided by Bogart et al. was used. The data were censored for analysis on May 11, 2017. The intention-to-treat analysis was done for estimating progression-free survival (PFS) and overall survival (OS). PFS was defined as the time interval in days between the date of randomization to the date of progression or death, whichever was earlier. Patients who did not have any of these events were censored at last follow-up. OS was defined as the time interval between date of randomization to the date of death due to any cause. Patients who were alive were censored at last follow-up. PFS and OS curves were generated using the Kaplan–Meier product-limit method. OS was partitioned in three health states for QTWiST analysis. TOX state was defined as the cumulative number of days spent in grade 3 or above toxicity post randomization and before progression. The time spent in grade 3 or above toxicity after each cycle was documented and a summation of all such time periods was done to get the TOX value. For example, if a patient had grade 3 toxicity for 5 days in cycle 1, 3 days in cycle 2, and 7 days in cycle 3, then the TOX value was 15. If patients had 2 or more simultaneous grade 3 or above toxicities, then the time between the appearance of initial grade 3 toxicity and resolution of all toxicities below grade 3 was considered. For example, if a patient had grade 3 mucositis for 2 days and during the same time period had grade 3 diarrhea, then the value considered for TOX calculation was 2 days only. In another scenario, if a patient had grade 3 mucositis for 3 days and on the day of its resolution developed febrile neutropenia which persisted for 5 more days, then the value considered for TOX calculation was 7 days. TWiST state was defined as the cumulative number of days spent post randomization and before progression without grade 3 or above toxicity. Hence, TWiST state = PFS-TOX state. REL state was defined as the time spent in days post progression till death. Hence, REL state = OS-PFS. μTOX and μREL are the utility scores for TOX and REL health states. The difference in mean QTWiST scores with its 95% CI and corresponding P value between the two arms was calculated. As utility score values for head and neck cancers are undetermined, a threshold utility analysis was performed using different weightage of utility values between 0 and 1 in 0.25 increment for μTOX and μREL. Score of 1 denoted time of perfect health while a score of 0 denoted time period which is similar to death. We recruited 92 patients, 46 in each arm. The incidence of grade 3 or above adverse events was seen in 17 patients (37%) in cabazitaxel arm and 16 patients (34.8%) in docetaxel arm. The restricted mean TOX state duration in cabazitaxel arm was 2.26 days (95% CI, 1.12–3.40) versus 1.54 days (95% CI, 0.56–2.53) in docetaxel arm [Table 1]. The TOX state duration was in favor of docetaxel arm. [Figure 1] and [Figure 2] show the partitioned OS curves for cabazitaxel and docetaxel arm, respectively. The area shaded in blue depicts the TOX state, the area with red color depicts the TWiST state, while the area in green represents the REL state. Similar to TOX state, the mean TWiST and REL duration were in favor of the docetaxel arm [Table 1]. The patients in the docetaxel arm, on an average, spent 7.19 days more in TWiST state and 29.49 days more in REL state. The results of threshold utility analysis are shown in [Table 2]. The results across all permutations and combinations were in favor of docetaxel arm. 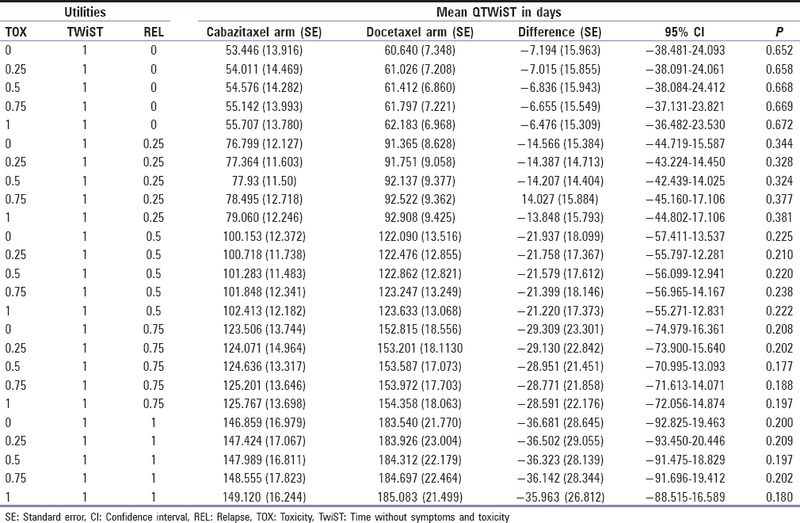 The lowest mean QTWiST in docetaxel and cabazitaxel arms was 60.64 and 53.45 days, respectively, while the highest mean QTWiST in docetaxel and cabazitaxel arms were 185.08 and 149.12 days, respectively. The median OS as reported by us earlier was 115 days (95% CI, 74.04–155.95 days) in cabazitaxel arm versus 155 days (95% CI, 148.6–161.4 days) in docetaxel arm. 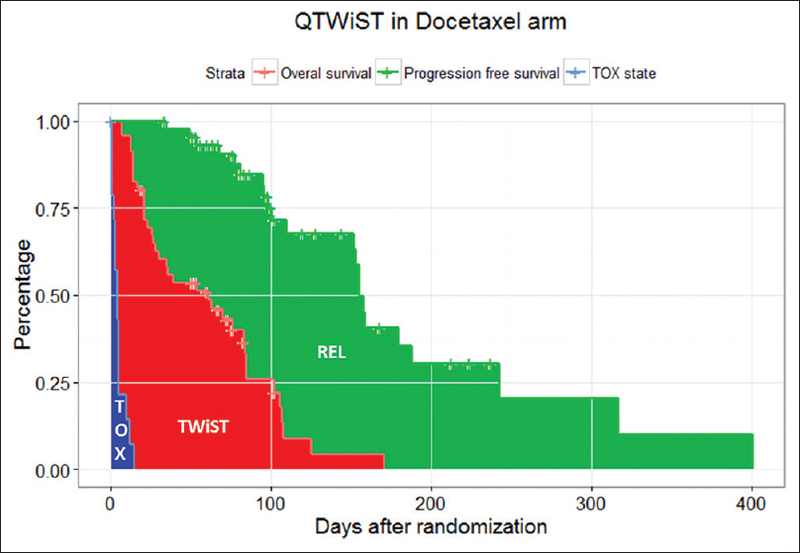 For any combination of utility score of REL >0, with any combination of utility score of TOX, the difference in mean QTWiST was greater than 14 days, in favor of the docetaxel arm. Palliative chemotherapy in the second-line setting in head and neck cancer provides modest improvement in OS. This is accompanied by adverse events related to these therapies. Nearly three-fourth of head and neck cancer patients do not prefer to have a chemotherapy regimen which leads to a >10% risk of having adverse events which impact activities of daily living. Hence, it is necessary to judge the quantum of benefit provided by a chemotherapy regimen under the hour glass of toxicity. Hence, a QTWiST analysis is necessary as it evaluates the adverse events, PFS, and OS concurrently. Our study results suggested that the disease control rate at 6 weeks was higher with docetaxel as compared to cabazitaxel. The grade 3 or above adverse event rates were 37% in cabazitaxel arm while they were 34.8% in docetaxel arm. The PFS and OS though numerically higher in the docetaxel arm were not statistically significant. The current analysis adds another dimension to these results. The mean TWiST duration was slightly higher in the docetaxel arm. However, the mean QTWiST across all permutations and combinations of different weights of utilities of REL and TOX states was higher in docetaxel arm. The P value, however, was not statistically significant for the difference in mean QTWiST between the two arms. However, the current study was not powered for detecting this difference as the sample size was only 92 and the rate of toxicity was similar between the two arms. Alternative ways of interpretation of QTWiST data exist. Revicki et al. have suggested that a clinically important difference for QTWiST is a difference of >10% of the OS. 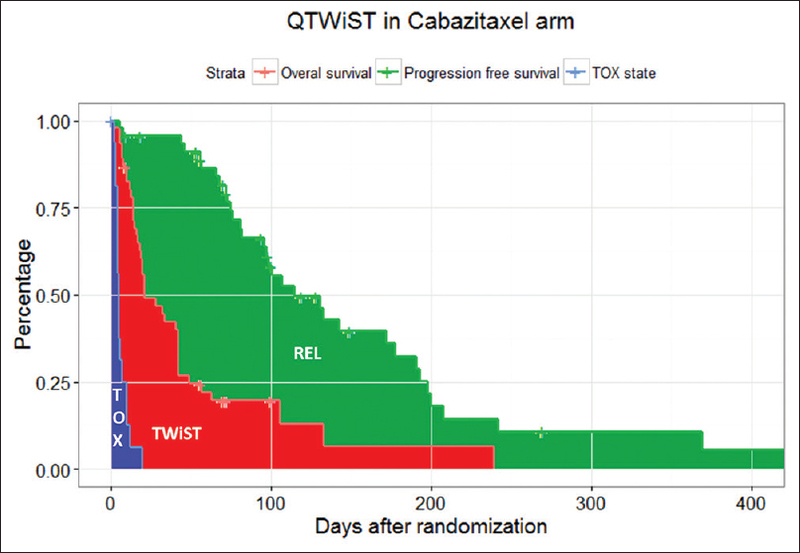 The median OS in cabazitaxel arm was 115 days and the difference in QTWiST across any combination of utility weightage for REL >0 with any value of utility score for TOX was >10% of the median OS. For value of REL weightage >0.25, the difference was >15% of median OS for cabazitaxel arm in favor of docetaxel arm. A difference of >15% is considered as a clinically important difference. The rate of adverse events and time spent in TOX state in both arms was low in our study. Interestingly, the time spent in REL state was higher in docetaxel arm. This higher time spent in REL contributed to a higher QTWiST in docetaxel arm. The lower time spent in REL in the cabazitaxel arm might be due to detrimental impact of cabazitaxel on the general condition of the patient which rendered a higher proportion of them unsuitable for further lines of chemotherapy. We used a variety of utility coefficients between 0 and 1 for the calculation of QTWiST in this analysis. The weightage of these utility coefficients in head and neck cancer in the palliative setting is unknown. Further, such coefficients need to be individualized according to each population. The weightage given by patients for his/ her life during toxicity period or post relapse would depend on multiple factors. Factors such as education, quality of life, cultural background, preferences, and expectations from life would have an impact. At present, such values are not available for Indian patients. However, the values of utility coefficients are necessary if future studies aim to use QTWiST as a primary endpoint. We aim to identify these scores in the Indian population in the near future. Patients randomized to docetaxel arm have higher QTWiST score than patients in cabazitaxel arm, and there was a suggestion that it was better, which would require confirmation in a larger study. We would like to acknowledge Sanofi. The study was funded by an unrestricted educational grant from Sanofi. Harrington KJ, Ferris RL, Blumenschein G Jr., Colevas AD, Fayette J, Licitra L, et al. Nivolumab versus standard, single-agent therapy of investigator's choice in recurrent or metastatic squamous cell carcinoma of the head and neck (CheckMate 141): Health-related quality-of-life results from a randomised, phase 3 trial. Lancet Oncol 2017;18:1104-15. Machiels JP, Van Maanen A, Vandenbulcke JM, Filleul B, Seront E, Henry S, et al. Randomized phase II study of cabazitaxel versus methotrexate in patients with recurrent and/or metastatic squamous cell carcinoma of the head and neck previously treated with platinum-based therapy. Oncologist 2016;21:1416-e17. Argiris A, Ghebremichael M, Gilbert J, Lee JW, Sachidanandam K, Kolesar JM, et al. Phase III randomized, placebo-controlled trial of docetaxel with or without gefitinib in recurrent or metastatic head and neck cancer: An eastern cooperative oncology group trial. J Clin Oncol 2013;31:1405-14. Cho BC, Keum KC, Shin SJ, Choi HJ, Lee YJ, Kim SH, et al. Weekly docetaxel in patients with platinum-refractory metastatic or recurrent squamous cell carcinoma of the head and neck. Cancer Chemother Pharmacol 2009;65:27-32. Fayette J, Guigay J, Letourneau C, Degardin M, Peyrade F, Orlandini F, et al. 2800 Cabazitaxel in patients with refractory recurrent or metastatic (R/M) squamous cell carcinoma of the head and neck (SCCHN): Final results of phase II trial UNICANCER ORL03. Eur J Cancer 2015;51:S557. Joshi A, Patil V, Noronha V, Dhumal S, Pande N, Chandrasekharan A, et al. Results of a phase II randomized controlled clinical trial comparing efficacy of cabazitaxel versus docetaxel as second line or above therapy in recurrent head and neck cancer. Oral Oncol 2017;75:54-60. Revicki DA, Feeny D, Hunt TL, Cole BF. Analyzing oncology clinical trial data using the Q-TWiST method: Clinical importance and sources for health state preference data. Qual Life Res 2006;15:411-23.